About 80 km southwest of Paris, in the beautiful historic town of Chartres, lies one of the best examples of French Gothic architecture - the Chartres Cathedral. The town is located in Boss - the granary of France. Known as the Notre Dame de Chartres (Cathedral of Our Lady of Chartres), this cathedral is considered to be an achievement in architecture, because until now it has managed to remain almost in its authentic and original appearance of the time when it was built in the 12th -13 century. Perhaps the cathedral in Chartres is the only religious building in the world with such an extent of recreated detail of construction and decoration, as they were originally built. In 1979 Chartres Cathedral is added to the list of World Heritage Sites by UNESCO. Since the early Middle Ages Chartres was primarily a place of worship in France. In town, at the site of Notre Dame de Chartres, were at least five similar religious buildings since it turned into bishopric in the 4th century. Then Emperor Constantine recognized Christianity and marks the beginning of the Christian church architecture, which undergoes a kind of renaissance in the 12-13 century. Notre Dame de Chartres was one of the most important religious centers of Europe, bringing with it a story that can be traced 17 centuries back. Furthermore, the cathedral in Chartres was the first French cathedral, dedicated to the Virgin Mary. This is a marvelous dark ages temple of humility, and today is invaluable in that it is among the greatest works of "pure" Gothic architecture in medieval Christian culture. 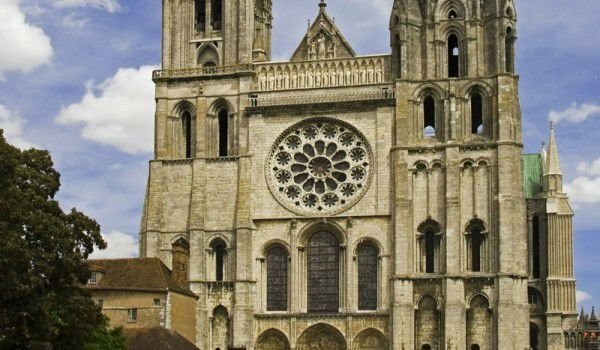 In its present form the Cathedral Chartres was built between 1193 and 1250. It was built thanks to the volunteer work of the residents, which were rich artisans, architects, masons and sculptors. Where the cathedral of Chartres was built, is a place considered sacred since the Celtic Druids. The magnificent temple was consecrated in 1260 by Ludwig IX. Among the hallmarks of Notre Dame de Chartres are its numerous statues and reliefs, for which the cathedral during the Middle Ages was called "The Stone Bible." This Gothic jewel in time became a model and inspiration for the construction of grand cathedrals throughout Europe, ranging from Prague, London, Cologne, and all the way to Spain. The interior of the Chartres cathedral is 37 meters high and has great acoustics, which is thoroughly conceived by its architects. This advantage is used today, because inside the temple is held a yearly music competition. The total area of 10, 875 square meters of the temple, is 32 meters wide / 46 m long. The magnificent Gothic facade of the cathedral in Chartres has three portals, one of which is Portal of kings, around which there are many sculptural reliefs with images of crowned persons. You will be impressed by a magnificent image of Christ, placed in the center of the company of two important historical figures. These sculptures date from the 12th century. The sculptures are actually one of the main features of the temple. Entrances on the north and south side are decorated with sculptures from the 13th century, and inside the cathedral can be seen over 10, 000 sculptures of stone and glass. Another hallmark of the church in Chartres are amazing stained glass windows. The Cathedral is famous for more than 1200 windows, which cover a total area of 2 000 sq. m. All are painted in the period 1205-1240, on the side of the Portal of kings can be seen a magnificent stained glass in the shape of a rose, depicting Judgment, with Jesus sitting in the middle. The west side of Notre Dame de Chartres is dominated by two towers, steeples, over 90 m tall. One was built in the thirties of the 12th century (105 m) and the other, which is a bit higher (115 m) dates from 1513. Many valuable religious objects are kept in the Cathedral Chartres for centuries. It is claimed that up to 13 century, here was preserved a wooden statue of the Virgin Mary carrying a baby in her heart. Unfortunately, the Virgin Mary with the infant was destroyed by a fire during the French Revolution.